The Blues continue their classy run of form with a 6-0 thumping of Watford at Vicarage Road. 15 goals in the last three matches for Guardiola’s men state City’s attacking prowess and true ambition this season – here are the ratings from an unforgettable day. Barely had a sniff of the ball all game, the Brazilian keeper was never really tested – even regardless of Watford’s temporary second half improvement. Distribution? Classy and assured as always. Had the bearing on Richarlison throughout the 90 minutes and pressed forward well to support the, at times, physically isolated Raheem Sterling. As well as setting up Aguero for his hat-trick. The Englishman and De Bruyne are also forming a telepathic partnership based on their link up play. City haven’t seen this much solidarity at right-back since Zabaleta was in his prime. 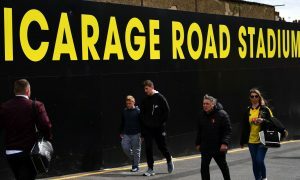 Despite previous performances being somewhat lacklustre, the ex-Valencia man’s presence with in form partner John Stones was finally felt at Vicarage Road. Along with Stones, Otamendi provided great composure and vision looking to start attacks whilst also keeping Watford’s new boy, Andre Gray, under wraps. The Argentine even got on the scoresheet with a thumping header, having met Silva’s looping cross to make it 4-0. Coming into this game with two opening night Champions League goals under his belt, the 23-year-old’s confidence was at an all time high. His newly-found swagger was evident when reading the game, dictating build-up play, getting back into defensive positions, dealing with the second half pressure, and marking Watford’s main threats going forward. Another convincing showing. As enthusiastic going forward as he is on Twitter, Mendy’s crossing fetish is all too apparent when City are on the front foot. Always determined to provide any threat. However, we just haven’t seen the Frenchman’s best defensive ability just yet. Tasked with sitting in front of the back four, Fernandinho just his job and did it well without being much of a standout performer. Whilst he worked well to plug the gaps in our defensive half, and tested Gomes early in the game, I can’t recall one real outstanding moment. Pat Nevin of BBC Radio 5 Live was so impressed by Sterling’s performance that he thought the Jamaican even outshone Kevin De Bruyne today. That may be debateable, but the fact Raheem caused Watford major problems definitely isn’t. As well as scoring a penalty for City’s sixth of the game, the threat was constant. His quick feet often proved too much for the likes of Cleverly and Doucore and Sterling’s pace was almost always uncontainable. Before being taken off for a well deserved rest, the former Wolfsburg playmaker ran the show. The first half was a mismatch when it came to shutting down the Belgian’s influence. Constantly linking up with Silva, De Bruyne assisted Aguero’s opener with a venomous cross before continuing to threaten until Watford were grateful for his withdrawal. Brilliant, yet again. Two assists on the board for Merlin, along with more gratitude from City fans everywhere for gracefully fulfilling his Iniesta type role and recycling the ball to the Blues’ devastating advantage. The Spaniard’s ability to sit in the middle and weave everything together is unprecedented. Five stars, Man of the Match – the Argentine was up for it from start to finish. A hat-trick was his reward for being, by a mile, the most dangerous man on the pitch – burying a De Bruyne cross, showing his predatory instinct to convert Silva’s hopeful squared pass, assisting Jesus with an intricate through ball and running through Watford to score from a tight angle. The home side simply had no answer for Sergio Aguero at his best. The tenacity of this seemingly small-framed Brazilian knows no bounds, highlighted when his strength to nick the ball resulted in City’s second of the game. Jesus’ true class shone through when he buried the Blues’ third beyond Gomes and into the far corner. His partnership with Aguero was flawless this afternoon, and although his South American counterpart will dominate the headlines, this performance was all but unnoticeable. It was wonderful to see Ilkay back on pitch after almost a year on the sidelines nursing a ligament injury, and we got to see a little glimpse of his passing ability. Didn’t make much of an impact with the three points all but sealed, but the Portuguese international tried his best to get involved. Despite coming on late, his form still looked imperious – bearing down on the Watford penalty area with intent whenever the opportunity arose.